Depending on operation options, filtration can sometimes be limited to straining. In certain cases and depending up the geological features of the reservoir, sulphates must be removed, particularly when formation water is rich in Sr2+ and Ba2+ ions. This prevents barium sulphate precipitation from occurring and therefore the clogging of source's porous rock. 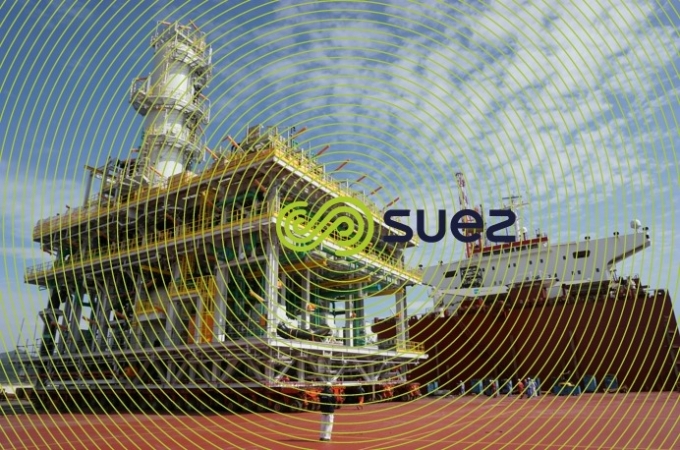 Sulphates may be removed using Sulphate Removal Units (SRU) comprised of a nanofiltration membranes and built specifically for FPSO units or offshore platforms. fine filtration (either via ultrafiltration, Dual Media filtration or cartridge filters). nanofiltration to remove sulphates and to achieve concentration levels lower than 40mg/L. The diagram below shows a two-stage SRU nanofiltration unit. In this system, the concentrate from the first stage is sent to a second nanofiltration stage. Using a second stage allows the quantity of water treated to be increased and a typical recovery rate of 75% to be obtained. The screens, whose water is used for cooling units and the injection water treatment unit, have a flow rate of 6,600 m3/h. 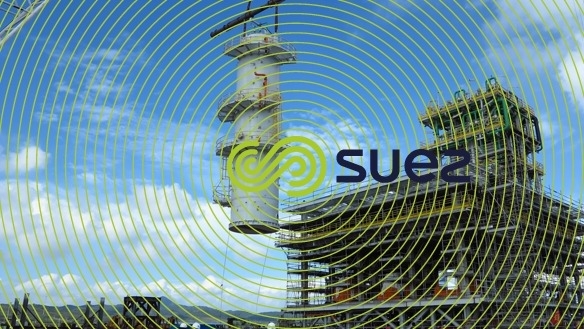 The SRU produces 962,962 m3/h (145,000 BWPD). On land, clarification treatment can be more extensive and include a settling tank, particularly as coastal and estuary waters will often contain silt. Oxygen de-aeration is carried out when gas effluent can be destroyed by flaring off by in one or more stages. When properly dimensioned, it will avoid subsequent excess consumption of costly reducing agents. In some cases, very heavy hydrocarbons have to be heated before they can be extracted. We then have to inject large quantities of vapour at 60-150 bar into the oil reservoir rock, involving the use of boilers. often silica removal. In fact, this water is often rich in dissolved and/or colloidal silica. 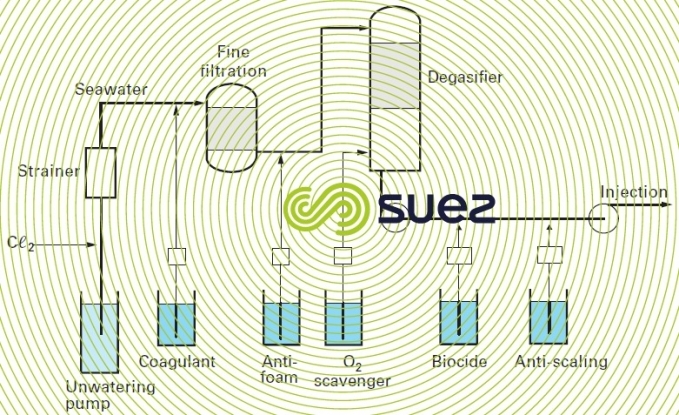 Silica removal (see chemical precipitations) will often be combined with a softener (lime or lime + CO3Na2…). As with all recycling, thorough knowledge of the quality of the raw water will govern the choice of recycling treatment and guarantee uninterrupted production of the vapour essential to the field’s output.